Hideyoshi Advances Prince Samboshi during a Ceremony at Daitoku-ji - Intriguing depiction of Oda Nobunaga's memorial service at Daitoku Temple in Murasakino. The great leader Toyotomi Hideyoshi, Nobunaga's loyal retainer, stands in the center with Nobunaga's infant grandson, Prince Samboshi, perched on his shoulder. 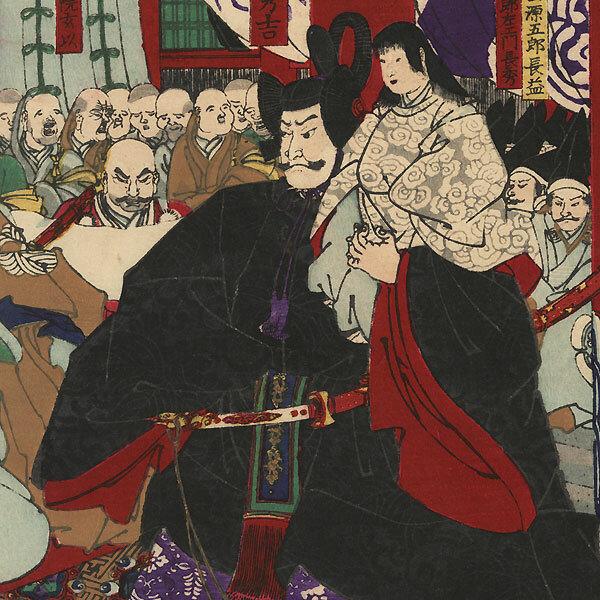 Hideyoshi supported Prince Samboshi as Nobunaga's successor, with himself as the guardian, a move disputed by Nobunaga's two living sons. 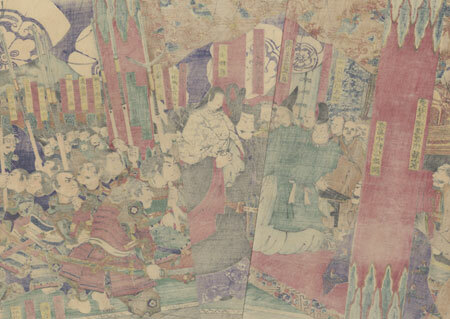 At left, a nobleman in a green robe reacts angrily, taken aback by Hideyoshi's actions. A group of samurai holding spears kneels at right, looking around with stern expressions. 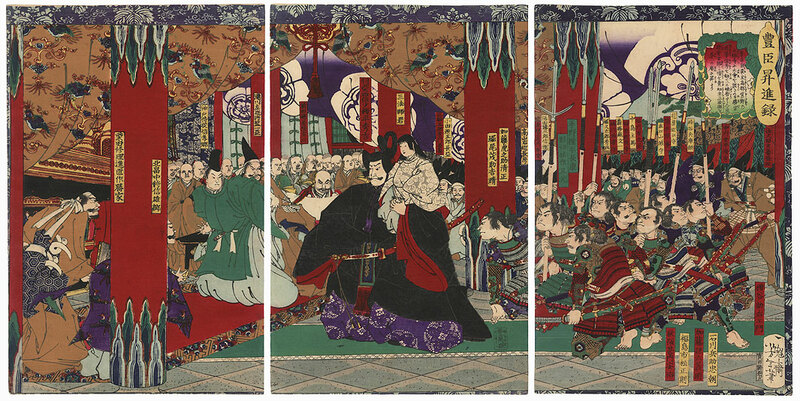 Beautiful detail in the temple setting, with elegant patterned draperies and decorative painting on the large red pillars, and a beautiful burnished paulownia pattern in Hideyoshi's black robe. A fascinating historic subject with wonderfully expressive figures and lively color. Image Size - 13 5/8" x 27"
Condition - This print with excellent color and detail as shown. Three separate panels. Hole, repaired. Very slight soiling. Please see photos for details. Good overall.